Old map by CHATELAIN -Carte De L'Europe Suivant Les Plus Nouvelles Observations De Messieurs De L'Academie Des Sciences . . . 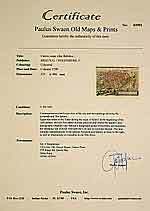 Title: Carte De L'Europe Suivant Les Plus Nouvelles Observations De Messieurs De L'Academie Des Sciences . . . Size: 18.7 x 23.4 inches. Condition: Paper slightly age toned, with attractive hand colouring. 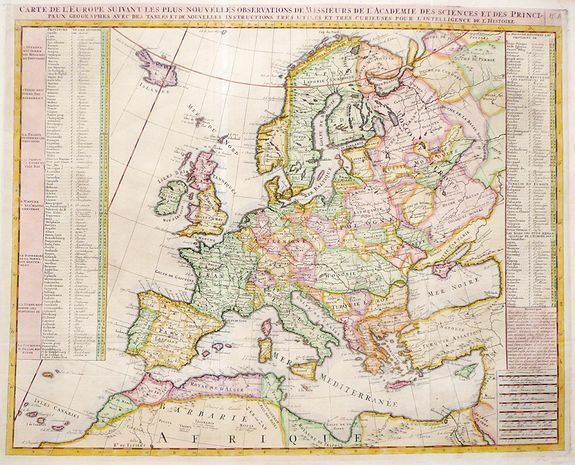 Attractive map of Europe, from Chatelain's Atlas Historique. Includes Iceland, and Russia in the north as well as the Black Sea and the northern tip of Africa in the south. extensive tables, listing more than 175 countries along with their principal cities, border the map. This fine map is a wonderful example from Chatelain’s important text. By combining a wealth of information and geographical observation, with delicate crisp engraving and an uncomplicated composition.